September 12, 2016 - Comments Off on Mofixx BV launched its new and innovative laparoscope holder! Mofixx launched its innovative laparoscope holder in the Dutch market, by successfully using Mofixx in several general and urology minimally invasive procedures. With the Mofixx laparoscope holder minimally invasive surgery can be executed with improved quality and improved cost efficiency. 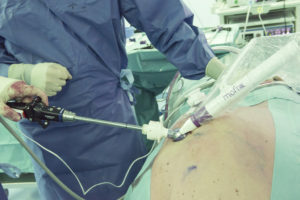 Mofixx fixates laparoscopes (and other instruments) in any desired position. By pushing a switch on the laparoscope it can be repositioned single handed and in an intuitive way, “drag and drop”. The benefits of using Mofixx are the improved working conditions for both surgeon and OR-assistant, stable image and the reduction of people needed for a MIS-procedure.